Rumspringa Break! is a lot like if Little Shop of Horrors, Book of Mormon and Sound of Music had some sort of polyamorous lovechild. Take two Amish girls determined to see the world before committing to their faith once and for all, add in the gritty city and an illegal weed growing operation, and the result is Rumspringa Break!, a new musical currently playing as part of the Next Stage Theatre Festival. 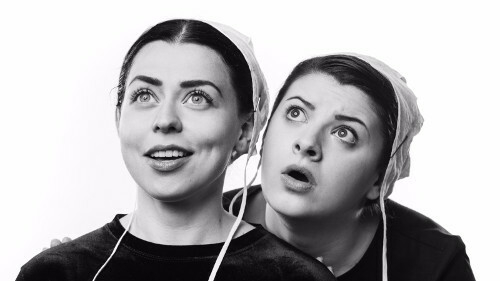 It’s their eighteenth birthday, and Hannah (Arinea Hermans) and Ruth (Georgia Bennett), two Amish sisters about to be baptised into the faith, make the controversial decision to embark on their rumspringa. While Hannah is excited to see the world, Ruth is less so–but the tables soon turn as they arrive in the fabled Buffalo and have to make it on their own. Rumspringa Break! has two major things going for it in particular. The first is its cast: Bennett and Hermans as the two hapless sisters are absolute gems, and their affection for each other–as well as their squabbling–is totally believable. Hannah’s clear-eyed optimism and thirst for life beyond the Amish world contrasts with Ruth’s more hesitant but kindly nature, resulting in two sweet characters who nonetheless have distinct personalities and dreams. Their sisterhood is the bright spot of an otherwise fairly dark tone. The second plus is a beautiful score, with plenty for Bennett and Hermans to do with their clear, angelic voices. The music is often funny and upbeat, with more than a few Alan Menken-style ‘I want’ songs that feel keyed into characters’ particular motivations. These range from lovely and heartfelt–such as “Wherever You Go, I Will Go”, an ode to the sisters’ devotion to one another–to empowering–such as Jamillah Ross’s super fun “21st Century Woman.” It’s a lush and lovely score (courtesy of composer Colleen Dauncey) with lyrics that are often whip-smart and damned funny (thanks to lyricist Akiva Romer-Segal). My favourite song, which I fell slowly in love with as it progressed, was one entitled “Grow.” Without saying too much, Hannah and Skor (a reluctant drug-dealer, played by Kirkland Doiron) sing to a plant to help it grow. As the song progresses, it’s clear that their affirmations and assertions that the plant is not broken and deserves to grow are no longer about the plant at all, but about both characters’ own self-doubt and longing. It’s a moment of genuine kindness and connection that Doiron and Bennett totally sell, and it’s truly touching. These strengths make the play endearing and fun throughout, though the second half feels less novel than the first, and relies on some tropes to carry its characters through (jealousy breaking the pair apart, or characters’ lies being discovered and temporarily stalling romance, etc). Similarly, while many of the supporting characters are great fun, they never feel like they’re given much room to grow or evolve beyond their initial portraits. Doiron’s eminently likeable Skor, for example, starts off strong with “Grow”, and there’s a lot of intriguing subtext about the character’s determination to survive, but he, too, ends up mostly relegated to the role of love interest. Jamillah Ross, similarly, has serious comedic chops and a killer voice, but her character–Cinnamon, the drug-dealing landlord who gives the girl a place to stay in return for growing her weed–feels a little one-note as-written, with limited transformation. This is, perhaps, the point–some people never change–but for a major character, the relationship between her and the girls never feels like it changes in any fundamental way (Ross is, regardless, a great energy on the stage). That being said, the musical doesn’t strictly need all of its character relationships to be as developed as the central one between the sisters, which works well. I just found myself wanting to see their relationships with the girls evolve as they got to know them, and the play never really feels like it progresses in this regard. Regardless, these are minor complaints in the grand scheme of things. The bottom line is that Rumspringa Break! is a wonderfully fun time: the music is a blast, the cast across the board is strong, and the writing is sharp and frequently laugh-out-loud funny. I don’t think you’ll regret braving the cold for this one. Photo of Arinea Hermans and Georgia Bennett by Tanja Tiziana.